I’m sure most of us can agree that our favorite gym class game was kickball, and wiffle ball came in a close second. Even though those gym class days are over you can still play kickball and wiffle ball at The Rock. 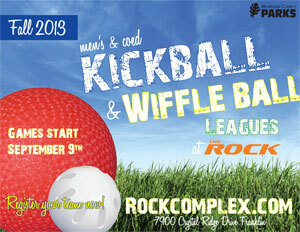 The Rock Sports Complex is pleased to announce the first season of Fall Kickball & Wiffle Ball Leagues. Games will start the week of September 9 and go through the end of October. A minimum of 12 players per team is recommended for a kickball team and a minimum of 3 players with a maximum of 7 players for a wiffle ball team. There are men’s only and coed recreational leagues for both kickball and wiffle ball. No carry-ins allowed, but don’t worry we got the beer covered. Pitchers can be purchased from our Umbrella Bar or concession stand. Hurry, registration deadline is September 1, 2013! Team fees are $295 for kickball and $205 for wiffle ball. No refunds. A complete team roster must be turned in before your team’s first game is played. © Copyright 2019 The Rock. All rights reserved. 7900 W. Crystal Ridge Drive, Franklin, WI.